After years of waiting, the new SFU stadium is finally set to begin construction. There was a buzz on Terry Fox Field as a crowd gathered on a beautiful Tuesday morning to break ground on the project. 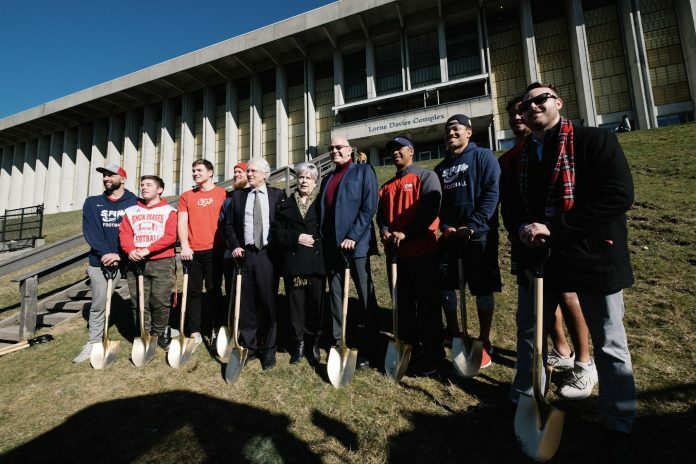 Among the crowd were SFU president Andrew Petter, SFU Athletics and Recreation senior director Theresa Hanson, SFSS vice-president student services Samer Rihani, stakeholders, media, student-athletes, and coaches. Everybody there was excited by what this new project means for SFU Athletics and SFU students for the future. The Perkins and Will-designed stadium project will include seating for 1,800-plus people, with roughly two thirds of these seats covered by a roof. It is jointly funded by both SFU and the SFSS, and has been previously estimated to cost $15 million. In this, SFU hopes that the stadium will benefit all students at SFU, not just those who watch or play varsity sports. At the same time, however, this new stadium should encourage more students to pay attention to Canada’s only NCAA school. This is an especially exciting time for the SFU players and coaches who will now play in front of a covered stadium. SFU men’s soccer players Eric de Graaf and Marcello Polisi also shared their excitement about the new project with The Peak. “In the fall for soccer when the weather is not too nice and it’s coming down hard having the roof over the stands will definitely encourage people to come out and support the team. So I think it’ll be great,” said de Graaf. “Hopefully we’ll be able to get some more people out to the games,” said Polisi. While this day has been a long time coming, it’s finally here. That being said, there is a lot of work that still needs to be done in order to meet the August 2020 deadline. For more information on the SFU stadium project, read our previous coverage here.